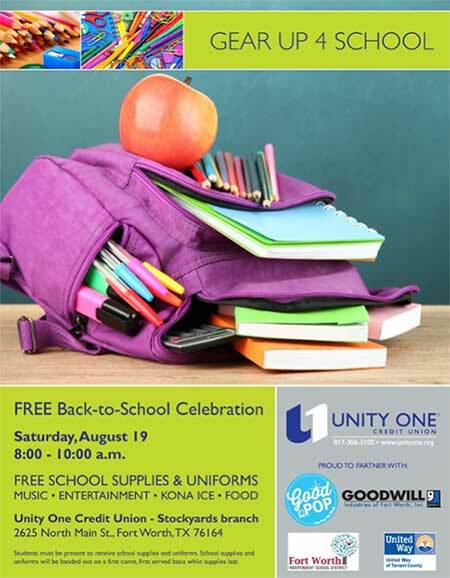 Unity One Credit Union is hosting their annual Gear Up 4 School event at the Stockyards branch on Saturday, August 19, from 8 – 10 a.m. Free school supplies & uniforms will be available to FWISD students on a first come, first serve basis (while supplies last). Plus, there will be free school supplies, food, Kona Ice, great music and entertainment for the kids. Location address: 2625 North Main Street, Fort Worth, Texas. This year the credit union is partnering with Goodwill Industries of Fort Worth to provide free FWISD approved uniforms for students in grades K-8 at the event. Students must be present to receive school supplies and uniforms. School supplies and uniforms will be handed out on a first come, first served basis while supplies last.